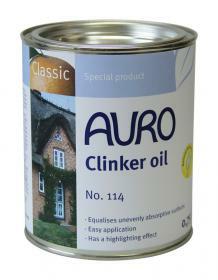 AURO Natural Clinker and Brick Oil is an eco-friendly and non-toxic product for protecting cotto and clinker, and for open-pored priming and surface treatment of clinker, stone, bricks, cotto tiles and unglazed clay tiles. Provides a 'fired up' effect that really does enhance the natural colour of your brick and stone, and creates a beautiful and rustic look. Protection and refinement of cotto, clinker, etc: oil for open-pored priming and surface treatment of clinker, stone and cotto tiles inside and outside.